Sunday morning at Place du Cap. 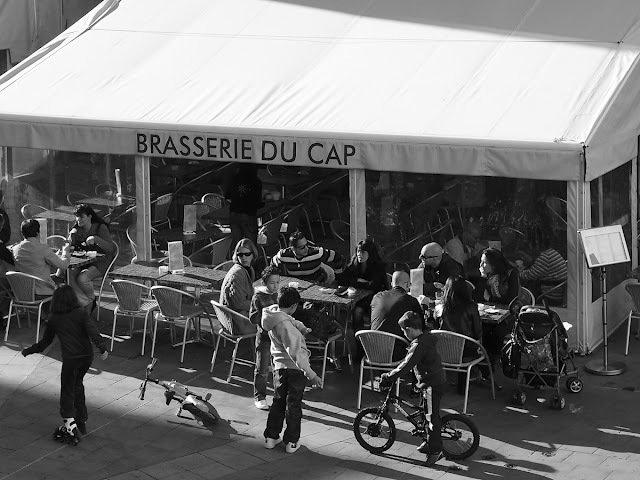 The grown-ups chat over coffee, the children ride bikes or roller blade around the square. The sun shines. Everyone is happy. Dimanche matin, Place du Cap. Les adultes discutent autour d'un café, les enfants font du vélo ou du roller autour de la place. Le soleil brille. Tout le monde est heureux. Everyone is happy! And that matters a lot.....this picture reflects it well. ah, to begin one's day inside this photo. I love Sundays in Menton. Families come to visit Grandmere. Children are everywhere. Young people walk along with lovely boxes of pastries they are bringing for Sunday lunch. The butcher shops are open with delicious-smelling chickens roasting away for lazy cooks. What a wonderful place to be!